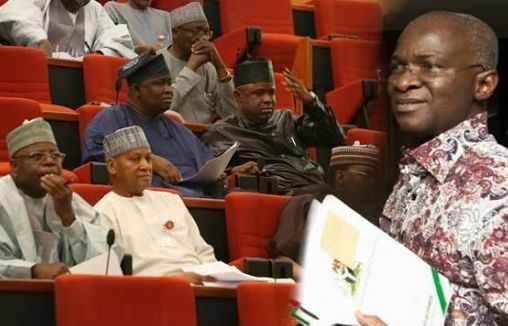 The Minister of Power, Babatunde Fashola has denied allegations of fraud by senator Dino West of the All Progress Congress (APC) against him and the Ministry of Power, Work and Housing. Melaye had alleged that the power ministry diverted $35million to the Afam fast power project without the approval of the national assembly. But Fashola in a statement denied the allegation of financial impropriety, saying fact could have been easily verifiable by a simple letter from the senator to the Ministry. According to Fashola, the country must be careful about what it say and do with regards to investments and investors which is clearly needed in all sectors of developmental life, particularly in infrastructure and power. He said, “Before perception becomes reality, I feel compelled to make this Statement in response to allegations bordering on financial impropriety raised on the Floor of the Senate against the Ministry of Power, Works and Housing, my Office as Minister, the staff of the Ministry and by extension my person. “The sum and substance of the allegations to which the Ministry will provide full, factual and detailed response when formally invited are that: An amount in the region of $350million being part of a $1billion Eurobond facility taken in 2013 has gone missing or has been diverted and that the Ministry, had procured a contract for Afam Fast Power and paid $26million or thereabout for it. “With all emphasis, I state that there is no factual basis for the allegations. The Ministry, my staff and I have done nothing wrong and we will collaborate fully with the Investigating Committee when called upon. For now, it suffices for members of the public to note that I wasn’t a Minister in 2013, and that when Government raises a Debt like the Eurobond, it is the Debt Management Office that manages the Debt and not the Ministry”. “The Nigeria Sovereign Investment Authority (NSIA) had on Monday, 6th November 2017 issued a Statement on the Front Page of The Nation Newspaper explaining that the money was not missing, stating also that the $350 million had been invested and that interest had even accrued on the money”. “If there was no ulterior motive for the allegation, this was enough reason for a reconsideration of the presentation of the Motion on the Floor of the Senate on the 8th of November 2017. But the story seemed to have changed from “missing money” last week, to a “desperate attempt to retrieve the money”, this week”. “As for the Afam Fast Power, the sum and substance of it is that it was an investment by the General Electric, a globally reputed Original Equipment Manufacturer (OEM), to invest in our country and support our effort to get good quick power under our Roadmap of Incremental, Steady and Uninterrupted power”. “They offered to do this by providing Nigeria with mobile turbines of 600MW if we could find a location with Gas and Transmission evacuation infrastructure. The Afam Power Station fitted because it had transmission and evacuation facilities but all its turbines had been virtually run down. The investment was contingent on paying $27,990,000 million which was 15% of 8 (eight) units of 30MW turbines each totaling 240MW valued at about $186,600,000:00 and this payment of $27.9m was made without breaching any law”. “At this moment, the turbines have arrived Nigeria and currently at the Onne Port. This is verifiable just as works are on going on the site – civil and engineering – preparing to receive the turbines , and install other equipment already at site. All of these are verifiable by all well meaning Nigerians who may want to undertake the inspection. We expect that the project will be commissioned soon enough to add 240MW to the Grid. This will be one of the fastest power projects when delivered, compared to inherited power projects before this Administration”. He also said investors do not require Parliamentary approval to invest in Nigeria. “Investors to the best of my knowledge do not require Parliamentary approval to invest in our Country. All of these facts could have been easily verifiable by a simple letter from the Senator to the Ministry without the furore and suggestions of wrong doing and malfeasance.